Liquid Foot Care is a unique liquid formula that helps protect cattle against digital dermatitis. The special lime formulation has been developed to stay in long term suspension so that it is always ready to use, however some settling can occur in the IBC if the liquid is left - if this is the case simply agitate or stir before use. 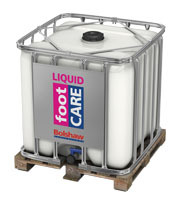 Transfer the Liquid Foot Care directly to the footbath without any preparation. 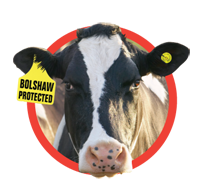 The viscosity of Liquid Foot Care means that successful application is easily visible; each cow emerges from the footbath effectively wearing white socks! For best results cows should go through a water bath first. If bathed when the feet are dirty the muck and any infections could get sealed in. Long lasting protection with the ‘white socks’ effect! Easy to use. No mixing required. Environmentally friendly. Non-hazardous. No health concerns. Liquid Foot Care is available nationwide. Each IBC contains 1000 litres of ready mixed solution.